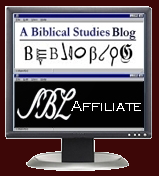 Biblical Studies and Technological Tools: SBL releases new SBL BibLit font! I just received this excellent news from SBL. What this Unicode font does is combine the previously released SBL Hebrew and SBL Greek Unicode fonts and add transliteration characters. Click on the links to obtain the font. The Society of Biblical Literature is pleased to announce the newest font in the SBL fonts series, SBL BibLit. This font contains Latin, Greek, and Hebrew characters, including the characters suitable for the transliteration of Ancient Near Eastern and Mediterranean languages. When combined with appropriate software keyboards, SBL BibLit allows for the use of one font for all biblical languages. This release is of a regular weight only; italic and bold weights will not be released at this time. In addition to the release of the SBL BibLit font, SBL is also making available software keyboards for both Windows and Macintosh OS X operating systems that give easier access to the diacritics necessary for the transliteration of Ancient Near Eastern and Mediterranean languages. These keyboards, along with the font file and the previously-released SBL fonts, can be downloaded from the SBL website. including platform-specific instructions for Windows 7, Windows 8, and Macintosh OS X. Joining SBL Hebrew and SBL Greek, SBL BibLit is the third font of the SBL font series. All of these fonts were commissioned by the Society of Biblical Literature to assist in the society's mission to foster biblical scholarship. John Hudson of Tiro Typeworks designed each font, ensuring that each one represented the cutting edge of font technology, maintained full Unicode compatibility, and that each would be as beneficial as possible to scholars in biblical studies and related disciplines. SBL is pleased to present this font as the final installment and the culmination of the initial font series.